When I was in high school, if someone said they dropped an oscilloscope on their foot, it would be cause to go to the office for first aid, or possibly even call an ambulance. Today, if I dropped this scope on my foot, I would be more worried about the scope than my foot. The Hantek 6022be digital oscilloscope weighs 13.3 ounces, and is a wonderful example of how technology gets cheaper and better with time. The line cord alone of an old analog oscilloscope might outweigh this tiny model. 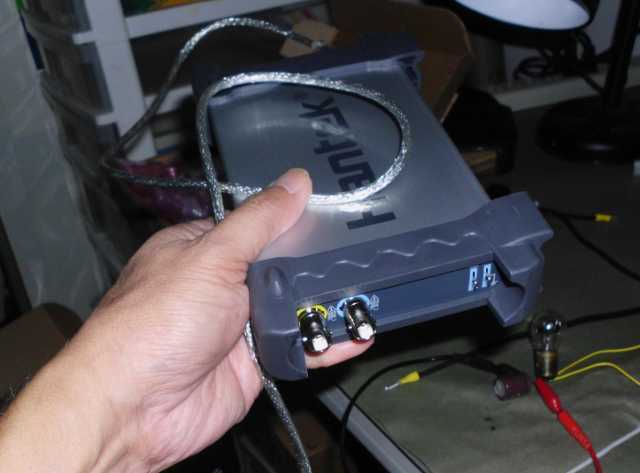 And by the way, the Hantek has no line cord – it draws all it needs from USB, though its PC connection. I bought this instrument on eBay for $69.14, with free shipping. Not since Adventures in Babysitting have I had such low expectations for something, and been so pleasantly surprised. For that paltry price, I got the scope, two probes that are settable for x1 or x10, and the software. This model has most of the features of the analog scopes of yesteryear, including a built-in calibration source. It is, of course, a storage scope, and can send output directly to a printer, or save it in a variety of file formats, including bitmap and spreadsheet. There is also the handy feature of time, voltage, and frequency measurement by just dragging a cursor. My first use of this scope was to debug an overheating problem on a DC-DC converter circuit. This was a tough problem to diagnose without a scope, but is now trivial. I was blind, but now I see. Below is the troublesome driver circuit for the main power MOSFET. R5 is driven directly from a processor output pin. No wonder the MOSFET was burning up! Look at that crappy rise and fall time. It’s like 4 μS for each transistion, which is horrible, considering this is only a 4.7 μS pulse. Any time the transistor isn’t fully on or fully off, it’s wasting power. As a side note, observe the little nick in the rising waveform, marking the place where the transistor turns on and starts charging the Miller capacitance. Better, but I’m still not happy with the risetime. Note that the incoming pulse had to be inverted in software. No big deal. The transitions are quick, but that falling edge rings like the phone of a guy who just won the lottery. The trace is moved up to show the ringing more clearly. Looks like it’s 5 volts peak to peak! The ringing is not severe at the actual complementary pair output. This is likely more representative of what the real circuit will do on a PC board. With a 15Ω series resistor on the gate of the power MOSFET, the ringing is mostly gone. Although the actual design might not need it, I will put space for such a series resistor on the PC board just in case. Surprisingly, the scope was able to show this ringing at over 20 MHz. The instrumentation says 2 MHz, but note that I have the cursor set to measure 10 cycles. There is only DC coupling. If you want AC, you’ll need to build your own test jig. The triggering has no noise filter on it, so is very erratic. The trace buffer is usually deep enough to capture what you want, but it might take several tries, and/or you might have to scroll through a lot of data. Speaking of scrolling, there are no scroll bars, a serious user interface deficiency. As the software stands today, you can drag the screen right or left, but with a deep buffer, may have to drag literally hundreds of screens to get to the point of interest. What is really needed is the ability to zoom in on a chosen area. Perhaps that will be added in a later version of software. The software does have the ability to export the data buffer as a text file, so maybe someone could write a utility to display and zoom the trace offline. However, the values output in the text file might need adjustment. I measured a known 5.2 volt signal, and the text file said it was 6.2 volts. Triggering is not reliable, especially at high speed sweeps, and especially in single sweep mode. I suspect that what the software does is blindly capture a data buffer, then scan to see whether there is a trigger event in it. If no trigger is found, the software then captures another data buffer. Needless to say, at high sweep rates, there is a lot of deadtime between capturing buffers while the software is busy looking at the captured buffer. If a trigger event should occur within this deadtime, the trigger would be missed. For repetitive signals, this is less of an issue, as sooner or later, by plain dog luck, a trigger event will be captured. The scope is NOT isolated from USB ground, which on a computer is typically connected to the ground on the wall plug. You cannot connect the ground clip of a probe to (say) line voltage to take a reading. You’ll need to either use an isolation transformer, or a laptop running on batteries (not plugged in) to do this sort of thing without blowing something up. There is no mention in the specs, but it seems that actual input voltage to the scope is limited to 5 volts. This is not surprising, since the USB voltage is 5 volts. So if you use the included 10:1 probe to measure something that is (say) 75 volts, it will read as 50 volts. If you want to measure between 50 to 500 volts, you need a 100:1 probe, not included. Of course, if you wanted to be cheap about it, you might just put a 90 MΩ resistor in series with the included probe. The software only works on Windows XP and later. It does not load on Windows 2000. If you have Windows 7 or later, you need to go to the Hantek site to get drivers that are not on the included CD. There is OpenHantek software that runs on linux, but it does not support the 6022BE at this time (2013). If you are handy with software, you could make a lot of friends by porting this open source software to work with the 6022BE. There is also some software called Open6022BE being developed here by a user named “RichardK,” with documentation by “Matchless,” and testing from the community at large. At this writing (March 2014), the software is still in Beta, but I find it so much better than the stock software, that I already use it on my home bench. For your convenience, I have mirrored the Open6022BE software and source here. UPDATE (22-Dec-2016): I have written my own open source alternative software. You can get BasicScope here. Do not expect any support from the manufacturer in China. Their site is very sparse with English help. The scope trades off sample rate and sample size; you cannot get the 48 MHz sampling at the same time as the 1 MB buffer. Once you set the sweep rate (time per division), the sample rate and size are fixed per the table below. Data from Rick Law on this forum, plus a bit of data I filled in for completeness. In spite of the above, I’m still super-pleased with my purchase. I am looking at the same oscilloscope and hope you can answer what I hope is a simple question. Can I use that scope to evaluate the sine wave output from generators and various inverters? I enjoy writing reviews and would like to improve the quality of my eval by adding some information concerning the wave forms of the various devices. This tool looks like it could do the job but the specs don’t mention AC, only DC. My initial study shows that DC should work but I need it to handle 120 and 240v waves. Any help or suggestions is appreciated. The Hantek scope I got is ONLY DC coupled. There is no provision for AC coupling, although I suppose you could build in your own capacitor, somehow. The ground on the scope is NOT floating, but is attached to the USB ground, which on most computers, is attached to the ground on the wall plug. So if you’re going to measure line voltage, you definitely don’t want to connect the ground of the probe to one line, and the tip of the probe to the other. That said, the scope will handle an input of up to 500 volts, which should be good enough to measure line voltage. What I do to get around the lack of a floating ground is connect the Hantek to a laptop, and run the laptop completely off its battery, never plugged into the wall. I -think- the Hantek software comes with an FFT, so you can measure spectral purity of an AC waveform. But if I’m mistaken, the scope can still output a data file, which you could analyze with your own software, theoretically. The scope has a 48 Msps sample rate. That’s plenty for studying an inverter or power supply from the external point of view, but if you want to open up the device and measure, say, the risetime of internal signals, you’ll wish you had a faster scope. If there’s anything more I can answer for you, I’m here. As a follow up question, if you have time or desire is more about scopes in general. I have a limited budget here, perhaps a couple hundred (used is also an option) and desire to eval wave forms of inverters etc as mentioned above. If there are other options out there you feel might work better, a pointer is appreciated. Since I hope to include a picture of the wave form in the reviews, I felt something like this running on the PC might enable that easier, but likely other systems with LAN or USB output and abilities to save might work even better? I looked at a few options for what I needed to do, including just buying an old used scope off craigslist for maybe $30. My budget was much lower than yours, more like $100 max. The Hantek 6022BE was available on eBay for less than $70, including shipping. Occasionally, there will be someone selling a used one, but there isn’t much price advantage. It turns out to be good enough for what I need to do, which is switching power supply design. Hantek also makes some higher end models with higher sample rates, and there are other companies such as PicoScope. Those exceeded my budget, so honestly, I can’t really say I looked at them. Going even cheaper, it’s possible to use the microphone input on the sound card of a computer as a scope. I believe there is free software out there somewhere to do that. That wouldn’t have worked for me as my signals are too fast, but it might work if all you’re doing is evaluating 60 Hz power outputs. And also, you’d still need to buy probes, and there would be the issue of the ground being tied to the computer’s ground – most likely the same as ground in the wall. It’s the sort of thing I would have done at 16, when I had no money at all, but not worth it for most engineers. Thank you for the great article and information. Thanks! I could not figure out how to set the trigger level in that program. To make things worse, I have an XP virtual running to use the thing and running it at less than 50us / div crashes my virtual usb driver (and xp) *grrr*, I’m really hoping someone ports the thing to open hantek (I doubt it will be me). Yes, it seems like the hardware is actually sound, but the software was just thrown together, and could use some work. I kind of wish that Hantek would just open up their own source – the program could be much improved by a few tweaks, and if anything, Hantek would sell more scopes with better software. If they would just publish their protocol, it would go a long way – at the moment people are forced to reverse-engineer the command set with USB sniffers. Thanks, Richard! I’ve been following your work with great interest. I’m updating this article to mention your software. Thanks for the link below. I’ll try to edit it to track your latest version, if that’s all right. Hi richardk! Do you think to release a opensource repository? I would like to implement a LabVIEW version. The active discussion on Richard’s excellent software project is on the eevblog.com link above. That would be the best way to contact Richard K, although he is quite busy at some times. I believe he had intentions to open source his code once it was cleaned up. Hello! Thank you for this good review! Thank a lot. Do anyone have some hardware improvement for this good price/performance scope? I have no doubt that there will be a 100 MHz version at this same price point in the not-too-distant future, given the way technology advances. The way the 6022be achieves low cost is that it has no hardware trigger, and nearly no data buffer on board, relying on the host computer to do everything. But to answer directly, I’m not directly aware of any hardware improvements. Try the eevblog.com site above for more discussion of test equipment in general. i was just wondering if the RichardK soft will work with the 6022BL. Actually, it seems to be the same model like 6022BE but with more logic features, and it costs almost the same. Did anyone try it ? Hi, Matthieu. I’m assuming that you got directed here from the eevblog.com forum? That would be the place to ask about the 6022BL. Unfortunately, I don’t have one, so don’t know.